Hanoi is so hot right now. And we’re not talking about the warm embrace of the mid-twenty degrees Celsius in December. The Vietnamese capital is taking a three-wheel bicycle stroll up to the top of every travel bucket list, becoming one of the most popular destinations in the region. It’s where the late Anthony Bourdain slurped noodles and beer with former US President Obama. It’s where architecture translates to a blend of Southeast Asian, French, and Chinese influences. And it’s where silk, handicrafts, and pagodas sit picturesque by the famous Red River. Hanoi is buzzing. And if there’s one travel photographer who is capturing the city from an angle you’ve never seen before, it is she: Loes Heerink. Gracing the noted cover of Condé Nast Traveler this autumn, Dutch photographer Loes Heerink caught eyes and smiles with the release of her book Merchants in Motion earlier this year. 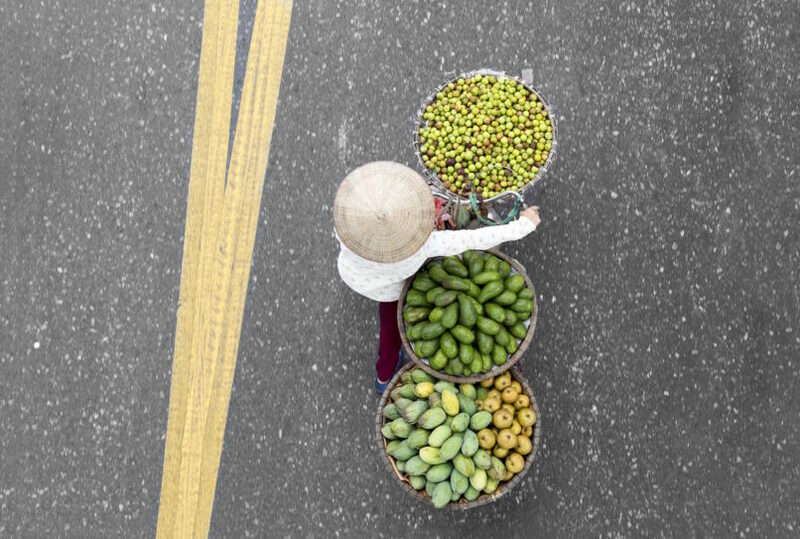 A collection of images from her photo series of the same name, the visual storyteller was inspired by the infamous street vendors, perching herself on bridges to capture them from an unusual perspective – that is, from directly above. The thousands of street vendors that mingle amongst Hanoi’s honking traffic and along the city roads have long been a highly snapped charm for visitors to the town. In a delicate cross between an urban Tetris and ballet of sorts, they balance everything from fresh Canh oranges to vibrant peach blossoms and lilies. However, on a cluttered city morning (they say Hanoi is the New York of rush hours) it is often a challenge for any artist to grip and grasp the fleeting specks of colour as they appear and disappear amongst the crowds. 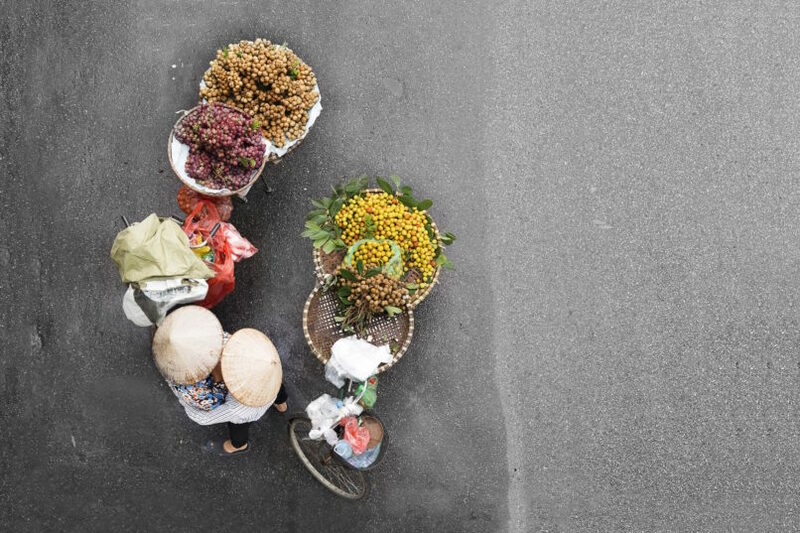 Only from above is where one can get a true bird’s eye view of the market goods in all their glory, and as luck would have it, during a spontaneous vacation in Vietnam, Loes Heerink was that peeking bird. Against the backdrop of her beautiful images, we managed to chat to the passionate photographer to get a look behind the lens for an exclusive snapshot into her favourite Hanoi haunts. 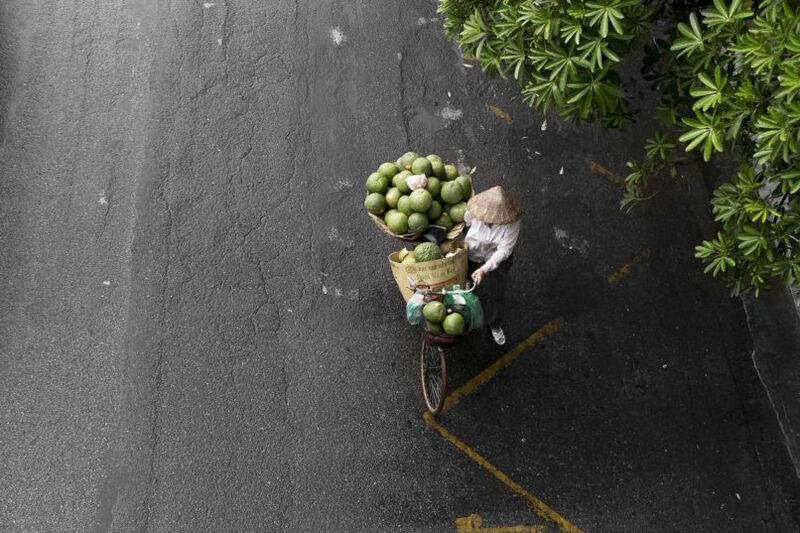 Consider it a travel guide from a unique perspective, from the woman who dared to climb, time, and catch Hanoi’s radiant charm in the blink of a shutter speed. 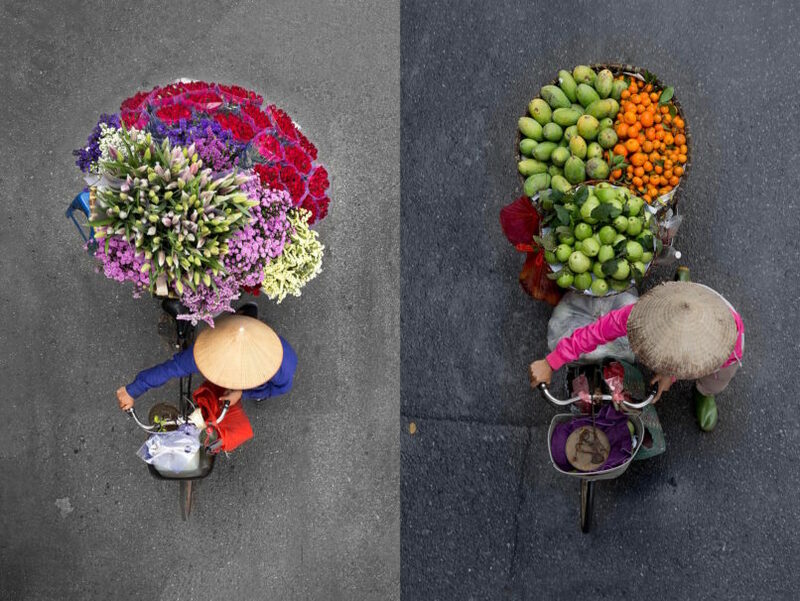 It’s no coincidence that the Netherlands native was inspired by the cycling street vendors in Vietnam. The European country is known far and wide as a cycling nation, and Loes herself rides a part of that wave. 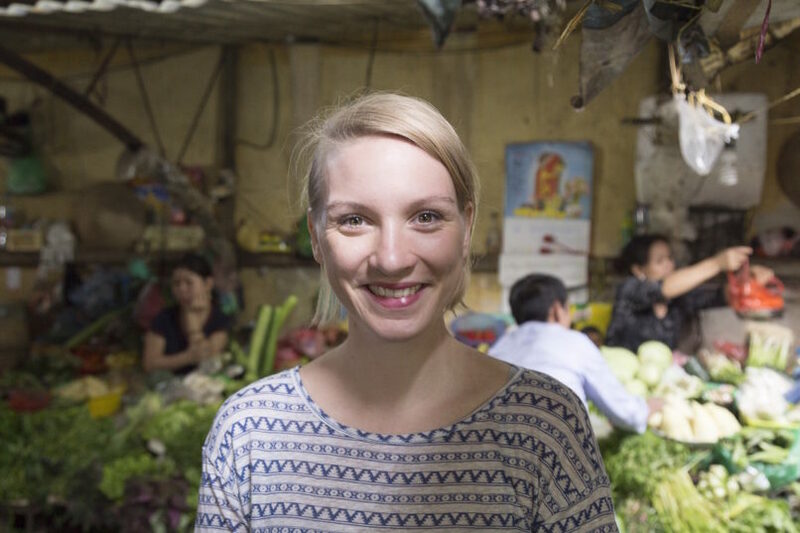 “From the moment I set foot in Hanoi I was intrigued by the vendors. I am from the Netherlands. I go to work on my cycle. I do my groceries on my cycle. I do a lot on my cycle. 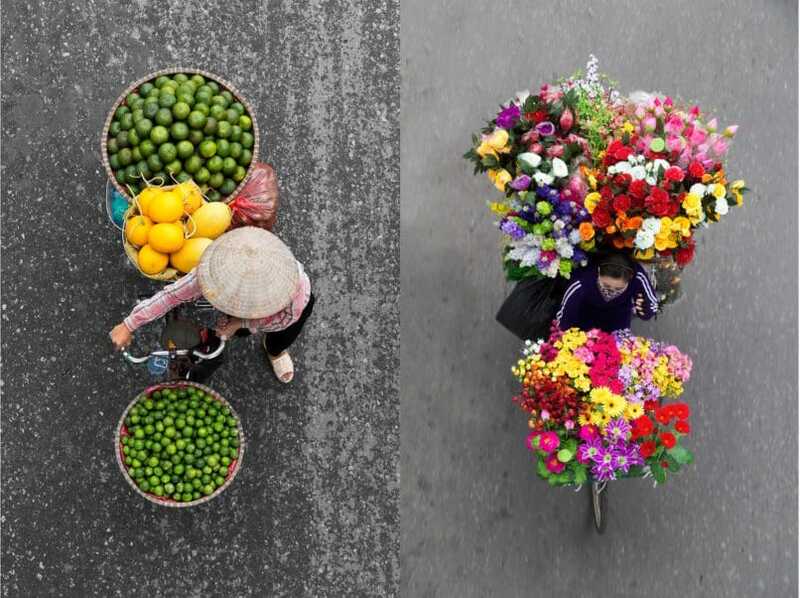 But never was I able to carry that many goods on my cycle.” Fascinated by the sheer logistics and vivid colours, the photographer got to work.